Where can I find the application forms for Maintenance Organisations (MOA)? The application forms for Maintenance Organisation applications are available here. Can you give me the name of Part 145 (MOA) organisations in [EASA member state]? According to the Part 145.1 EASA is the competent authority for organisations located outside the EU territories. Within the EU Member States each National Aviation Authority (NAA) is the competent authority. In accordance with above specified regulatory paragraph, EASA publishes the list of valid and non-valid Foreign EASA Part-145 approvals located outside of the EU Member States which are issued by EASA. Following the same reference each EU NAA is tasked to issue a similar list of approvals granted on its own territory. Unfortunately not all EU NAA do have such a list of national approvals or even a website. For the moment we can provide you with the list of EASA member states on our website. Do you have a list of Non-EU Part 145 (MOA) organisations? Where can I find more information about EASA Part-145 located in Canada? We have a Part 145 approval from a national authorities that has no Bilateral Aviation Safety Agreement with EASA. Now we are looking for an EASA 145 approval. What is to be done with regard to procedures, requirements and fee structure? On our Foreign part-145 organisations page you will find useful information with regard to the requirements, the timeframe and the approval procedure. Furthermore please consult also the User Guide for Applicants for Foreign Part-145 approvals and the application form EASA FORM 2. Please note that the EASA Fees & Charges Regulation (Commission Regulation (EU) 319/2014) has entered into force on 01 April 2014. For further information please consult the Fees & Charges FAQ. Please review especially table 9 of the Fees & Charges Regulation (Commission Regulation (EU) 319/2014). Is it mandatory to hold a maintenance organization approval from a local NAA prior to applying EASA for an EASA Part-145 approval or is it possible to apply EASA directly without any approval from local CAA? Please note that it is not mandatory to be an approved maintenance organisation from local CAA in country without bilateral agreement prior to applying for an EASA Part-145 approval for certain ratings and we confirm that it is possible to apply to EASA directly without any approval from local CAA. How much does my application/certificate cost for a Foreign EASA Part-145 approval? For costs related to your approval, please refer to the tables sorted by application type that are provided in the Annex of the EASA fees and charges regulation Commission Regulation (EU) No 319/2014. Please review especially table 9 of the Fees & Charges Regulation (Commission Regulation (EU) 319/2014). We are an FAA Repair station and would like to apply for an initial application to EASA Part-145? There you will find useful information with regard to the requirements, approval procedure and the fees & charges. It is required to complete EASA FORM 16 which should be submitted to your Principal Maintenance Inspector (PMI) at FAA. Please contact your PMI at FAA. We are an FAA Repair station and would like to apply for renewal of our EASA Part-145 approval? With regard to timing, these actions for renewal are completely disconnected from the applicant’s obligation to comply with EASAs Fees and Charges Regulation. Therefore please do not wait for the EASA invoice and proceed with the renewal process within the timeframe specified in the MAG. Please submit the completed EASA FORM 16 to your PMI at FAA. As soon as we will receive the complete continuation package from the FAA including EASA FORM 16, EASA FORM 9, Air Agency Certificate, operation specifications and repair station profile we will confirm receipt to the FAA and to your organisation. Currently EASA sends out the invoices 60 days after the renewal of the approval. Payment shall be made only after the receipt of the invoice. We are an Approved Maintenance Organisation (AMO) in Canada and would like to apply for an initial application to EASA Part-145? It is required to complete EASA FORM 17 which should be submitted to your TCCA Regional Office. Please contact your TCCA Regional Office. For more information you can visit our page EASA Part-145 Organisations located in Brazil and please review especially Maintenance Annex Guidance (MAG) EASA-ANAC. It is required to complete EASA FORM 18 which should be submitted to your supervising ANAC Airworthiness Regional Office. Please contact your supervising ANAC Airworthiness Regional Office for any further questions. How much does my application/certificate cost for a Foreign EASA Part-145 approval with applicable bilateral agreement (USA, CANADA and BRAZIL)? For costs related to your approval, please refer to the tables sorted by application type that are provided in the Annex of the EASA fees and charges regulation Commission Regulation (EU) No 319/2014. Please review especially table 12 of the Fees & Charges Regulation (Commission Regulation (EU) 319/2014). For further information please visit the Fees & Charges FAQ's. Do you have a list of Non-EU Part-147 (MTOA) organisations? Can you give me the name of Part 147 (MTOA) organisations in [EASA member state]? Further to your request, please be informed that the Agency is only responsible for those training organisations located outside of the EASA Member States. For those located within the EASA member states, the National Aviation Authorities are responsible for the approval and the publication of the "national lists". Therefore you need to contact local National Aviation Authority directly to find the information you are looking for. How can I apply for an EASA Part-147 approval? In order to apply for an EASA Part 147 Approval, it is required to send an application EASA form 12 together with a copy of the Certificate of Incorporation of the organisation (translated in English where necessary). The scope of approval applied for should be detailed as much as possible, and the number of staff to be declared in the application form should be limited to the staffs –included contractors- that will be actively involved into the Part 147 operations. The type and number of courses and the number of facilities should be mentioned on the application form. Following the reception of the application form 12, an eligibility check will be carried out; the purpose of the eligibility check is to ensure that the scope of the application is relevant, but also that the certification process can be carried out in a reasonably timely manner, taking into account -in particular- the availability of EASA surveyors. Please also note that travelling arrangements are subject to a risk assessment and surveyors may not be allowed to travel to certain regions/ countries. Once an application has been accepted, an estimate of the fees shall be provided to the applicant and upon acceptance the invoice related to the initial certification task shall be submitted. The contact details of the surveyor will be provided to the applicant and he is requested to contact the surveyor in order to organise the review of documents (MTOE, courses, exam questions…) as well as the schedule for the initial certification audit. This regulation is used to determine the applicable initial fees, and then the annual oversight fees. Please note that the fees are subject to an annual inflation rate and do not include the travel costs associated to on-site audits (flight & train tickets, accommodation and travel hours -which are charged on an hourly rate basis- etc...). These will be charged separately. How much does my application/certificate cost for a Foreign EASA Part-147 approval? Please note that the fees are subject to an annual inflation rate and do not include the travel costs associated to on-site audits (flight & train tickets, accommodation and travel hours -which are charged on an hourly rate basis- etc...). These will be charged separately. How can I apply for a Part-66 licence? If you want to get a Part 66 licence, you have to comply with the Part-66 requirements (in particular, 66.A.10 Applications and for experience: 66.A.25 “Basic knowledge requirements”, item (a), and 66.A.30 “Experience Requirements”). How much does my application/certificate cost for a Part-M subpart G Foreign CAMO Organisation? For costs related to your approval, please refer to the tables sorted by application type that are provided in the Annex of the EASA fees and charges regulation Commission Regulation (EU) No 319/2014. Please review especially table 11 of the Fees & Charges Regulation (Commission Regulation (EU) 319/2014). Further information via our Fees & Charges FAQ's. Associated audit travel costs (flight, hotel, daily allowance) are also charged to the organisation (you can consider an average of 2/3 audits per year with one/two auditors, based on the scope of work of the organisation). We are a UK company holding a Maintenance Organisation approval issued by the UK-CAA. In preparation for the UK leaving the EU and consequently the EASA system, can we already apply for an EASA approval to be valid as of the date when the UK will leave the EU? Please refer to Brexit page. We are a UK company holding a Maintenance Training Organisation approval issued by the UK-CAA. In preparation for the UK leaving the EU and consequently the EASA system, can we already apply for an EASA approval to be valid as of the date when the UK will leave the EU? We are a UK company holding a Continuing Airworthiness Maintenance Organisation approval issued by the UK-CAA. In preparation for the UK leaving the EU and consequently the EASA system, can we already apply for an EASA approval to be valid as of the date when the UK will leave the EU? Where can I find more information about Pilot Training Organisations and Aero-Medical Centres Organisations Approvals (Part-ORA ATO)? The application forms for Part-ORA ATO are available here. A Guideline for Applicants can be downloaded here. An Easy Access Rules document for Part-FCL, Part-ARA, Part-ORA is available here. We are a UK company holding a Approved Training Organisation (ATO) approval issued by the UK-CAA. In preparation for the UK leaving the EU and consequently the EASA system, can we already apply for an EASA approval to be valid as of the date when the UK will leave the EU? We are a UK company holding an Aero-Medical Centres (AeMC)approval issued by the UK-CAA. In preparation for the UK leaving the EU and consequently the EASA system, can we already apply for an EASA approval to be valid as of the date when the UK will leave the EU? Where can I find more information about Design Organisation Approvals (DOA) / Alternative Procedure to Design Organisation Approvals (APDOA)? The application forms for DOA and APDOA are available here. A dedicated FAQ section on design organisation related questions is available here. Where can I find more information about Flight Training Simulation Devices (FSTD)? The application form for FSTD is available here. A dedicated FAQ section on FSTD related questions is available here. We are a UK company holding an Flight Simulation Training Device (FSTD) approval issued by the UK-CAA. In preparation for the UK leaving the EU and consequently the EASA system, can we already apply for an EASA approval to be valid as of the date when the UK will leave the EU? Where can I find more information about Production Organisations (POA)? The application forms for Production Organisations are available here. Further information on POA related questions can be found here. We are a UK company holding a Production Organisation approval issued by the UK-CAA. In preparation for the UK leaving the EU and consequently the EASA system, can we already apply for an EASA approval to be valid as of the date when the UK will leave the EU? Where can I find more information about Authorisation for Third Country Operators (TCO)? The application form for Third Country Operators is available here. A dedicated FAQ section on TCO related questions is available here. How do I apply for a certificate/approval? Further applications will be introduced to the Applicant Portal in the future. Please inform us if you wish to receive further information or a demonstration of the portal. In case of questions and technical issues, please contact: Applicant [dot] Portal [at] easa [dot] europa [dot] eu. The use of the Applicant Portal has been introduced to other non-EASA Member State applicants. Please contact applicant [dot] portal [at] easa [dot] europa [dot] eu for further information. Note: The use of the Applicant Portal for applications concerning Major Change/Repair, Derivate, Minor Change/Repair, STC and ETSO will soon become mandatory. I would like to revise my application submitted through the Applicant Portal. What do I have to do? Currently, the feature for editing or revising an already submitted application in the Applicant Portal is still being developed. In the meantime, if you wish to make any amendments, please contact EASA by sending an email to applicant [dot] services [at] easa [dot] europa [dot] eu quoting the Applicant Portal request or task number. Upon receipt we will update our database accordingly. I have submitted my application, what happens next? Users of the Applicant Portal will instantly receive an acknowledgement email containing the request number as soon as the application has been submitted over the Applicant Portal. For submissions of applications via email and provided that the application is complete, we will acknowledge receipt within two working days and provide you with the EASA project number. I am applying from a non-EASA Member State, what requirements are there? A Bilateral Aviation Safety Agreement (BASA) exists between EASA and the USA, Canada and Brazil and aims at the mutual acceptance of certificates. As per the Technical Implementation Procedure (TIP) with the FAA (US) and TCCA (Canada), applicants applying to EASA have to submit their EASA application via their local FAA/TCCA office and request that their application be forwarded to EASA. The FAA/TCCA will forward the complete application package to EASA together with the FAA/TCCA concurrence letter. Applications that have not been forwarded via the FAA or the TCCA are considered incomplete and cannot be registered. For further information on the TIP - FAA, click here. For further information on the TIP - TCCA, click here. For further information on the TIP - Brazil, click here. I am a US applicant, what are the benefits of the recent TIP revision 6? TIP revision 6 entered into force on 22 March 2018. The verifying authority shall issue the corresponding certificate or design approval within fifteen (15) working days for design change and twenty (20) working days for TC of receipt of the complete application. This revision extends to all repair design their acceptance by the validating authority, removes the last restrictions to the acceptance of ETSO/TSO approvals and introduces the concept of Basic Type Certificates (limited to piston engines and propellers). Amendment 1 to the TIP was signed on 22 June 2018. I am a BASA applicant (US/CAN/BRAZIL), how do I use the EASA Applicant Portal? The bilateral applicant will complete the application data in the Applicant Portal and press “Submit”. The Applicant Portal will send an email to the applicant with the application data summary document (Application Acknowledgement, FO.APMAN.00046) attached to it. The applicant forwards the document to their National Aviation Authority in lieu of a completed EASA application form. Meanwhile, EASA will change the application status in the Applicant Portal to “Incomplete” . The National Aviation Authority reviews the application and forwards it together with the forwarding letter to EASA. EASA performs the full eligibility check and, if applicable, changes the application status in the Applicant Portal to “Registered”. The technical checks and investigation can start upon formal EASA acceptance. 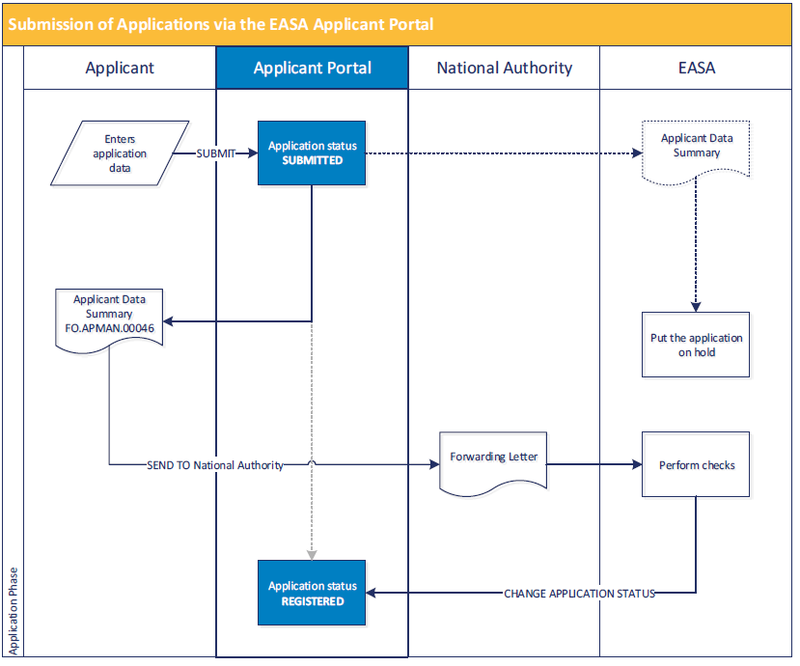 Can a US applicant use the EASA Applicant Portal? The US applicant can indeed submit the application online to EASA via the portal. An online application document is then generated, which replaces the current application forms as you know them. In order to stay in line with the bilateral procedures, the US applicant will send the online application document together with the requested data for the validation request to the responsible FAA ACO which will forward the complete validation request to EASA along with the FAA concurrence letter. EASA ensures that only once the FAA letter is received along with the application summary document and the requested data for the validation request, EASA will further proceed with the application registration. The EASA Applicant Portal simply logs the application, which is held pending until the FAA has reviewed the application and provided EASA with a concurrence letter. It is not required for US applicants to upload supporting documents for the validation request to the EASA Applicant Portal. The EASA Applicant Portal is currently set up to only provide the applicant with an acknowledgement message, not the FAA. As can be seen in the illustration, it is incumbent on the US applicant to actually notify the responsible FAA ACO of their EASA application by providing the online application document to the FAA. Once notified by the applicant themselves, FAA can initiate the review of their submission and only then can the FAA provide EASA with the required concurrence letter. Once EASA receives the FAA concurrence letter, which confirms that the FAA has conducted their review of the application, only then will EASA perform their full eligibility check of the application, and once eligible, the EASA task number is assigned and the technical checks and investigation will start. For further information, please consult the extensive EASA Portal user guide. The purpose of this message is to clarify to FAA certification staff and US applicants the use of the new EASA Applicant Portal. The new EASA portal is an alternative to the previous procedure of having to use MS-Word forms when submitting applications for design approval to EASA. Applicants can easily register to the EASA Applicant Portal by sending a simple email to Applicant [dot] Portal [at] easa [dot] europa [dot] eu. While the MS-Word forms are still acceptable, online submittal of applications over the Applicant Portal is now the preferred method by EASA for receiving applications. 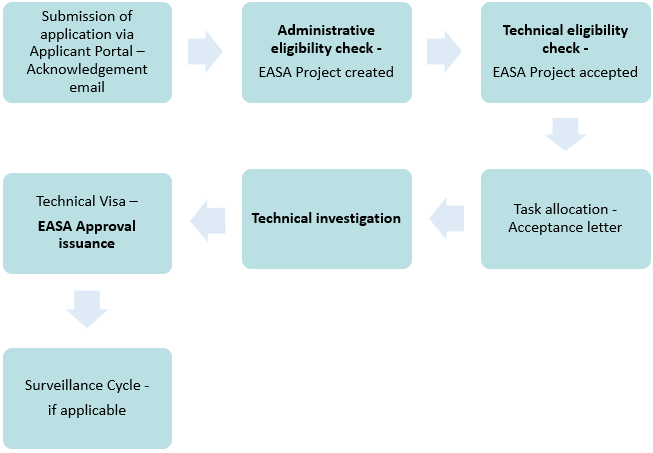 The overall application process to EASA under the TIP remains essentially the same. Can a Canadian applicant use the EASA Applicant Portal? Questions have been raised, suggesting the new on-line portal deviates from the TIP procedures that requires TCCA office submit the application to EASA. Use of the new EASA Application portal puts the applicant directly “submitting” an application before TCCA has the chance to review and endorse such application. You will find below an illustration explaining the process and sequence of the new portal. The use of the new portal (which is an on-line application) replaces the previous filling of MS-Word form. Once the on-line application is filed, the Canadian applicant will receive an acknowledgement message that an application has been filled. This on-line application will not be processed yet nor validated outright. It simply logs it, and is held pending until such time TCCA has reviewed the application and provided EASA with a forwarding letter. The EASA Applicant Portal is currently set up to provide the applicant only with an acknowledgement message, and not the TCCA. As can be seen in the illustration, it is incumbent on the Canadian applicant to actually notify TCCA of their EASA application by providing the Applicant Data Summary (FO.APMAN.00046) to TCCA. Once notified by the applicant themselves, TCCA can initiate the review of their submission and only then can TCCA provide EASA with the required forwarding letter. Once EASA receives the TCCA forwarding letter, which confirms TCCA has conducted their review of the application, only then will EASA perform their full eligibility check of the application, and once eligible the EASA task number is assigned and the technical checks and investigation started. If a Canadian applicant elects to use the MS-Word forms, the forms cannot be electronically submitted via the portal. The MS-Word forms have to be filled by the applicant and a copy submitted to TCCA, who in turn will file the application to EASA. While the MS-Word Forms are still acceptable, EASA prefers the transition to using the on-line application portal due to the efficiencies brought to the process (drop down boxes ensure the correctness of Applicant information, EASA product list, etc.). The new Applicant Portal requires our applicant to notify TCCA that they have filed an application to EASA that without such notification, their application will not be processed further by EASA. How much does my application/certificate cost? For costs related to your approval, please refer to the tables sorted by application type that are provided in the Annex of the EASA fees and charges regulation Commission Regulation (EU) No 319/2014. For further information please consult also the Fees and Charges FAQs. What is the certification process for a Type Certificate? As an EASA Member State applicant you need to prove eligibility by demonstrating capability in accordance with 21.A.14, i.e. be a Design Organisation Approval (DOA) or Alternative Procedures to Design Organisation Approval (APDOA) holder. However, Part 21.A.14(c) provides the possibility for any natural person to apply on an ELA 1 aircraft by demonstrating capability through a certification programme. Alternative procedures are not necessary. ELA 1 is generally defined as aircraft with a max MTOW of 1200kg or less, including balloons up to 3400m^3 and sailplanes. While applying for a DOA/APDOA, you may, in parallel apply, for a Type Certificate. However, the Type Certificate will only be issued once the DOA/APDOA has been granted. have the requisite technical capability available. Information on the related yearly fees and charges for both TC and DOA/APDOA applications are available in the Annex of our Fees & Charges Regulation No. 319/2014. Where can I find a list of Supplemental Type Certificates (STC) approved by EASA? EASA publishes a list of its approved STCs on the EASA website. The EASA STC list compiles Supplemental Type Certificates issued by EASA since 03/06/2004 and is updated on a weekly basis. STCs issued before this date or grandfathered STCs are not included in the list. Why can't I find an STC on the EASA STC List? The Agency applies its best efforts to ensure completeness of this list. 'Grandfathered' STCs issued by the EU Member States prior to 29/09/2003. Any STC approved or validated by an EASA Member State before the establishment of EASA is deemed to be approved under Regulation (EC) No 1702/2003 Article 2a. This covers all previous approvals from Minor Changes to Major Changes, STCs and complete aircraft, both certifications and validations with the exception of products of the former Soviet Union. It also covers the Flight Conditions approved for aircraft operating under national Permits to Fly issued before 28 March 2007. How do I know whether an STC has been grandfathered? Any STC approved or validated by an EU member state before the establishment of EASA is deemed to be 'grandfathered' under Regulation 1702/2003 Article 2 (3)(a). Unfortunately, a central repository of such approvals does not yet exist. Please contact the STC holder directly or review the websites of our member states' national aviation authorities. Please also refer to our FAQ “Who do I contact to request a copy of a grandfathered STC?" How do I know whether an FAA / TCCA STC has been validated by EASA? - It has been validated by EASA after 27 September 2003 (ref. Regulation 1702/2003). In this case, the corresponding validated STC should be published on the EASA website. - It has been validated by an EASA Member State before 28 September 2003. In order to verify whether a foreign STC can be considered EASA approved, we suggest that you contact the STC holder. Should you require EASA validation of a foreign STC which does not fulfil any of the two conditions above, please request the STC holder to apply. Alternatively, you may apply for your own STC but need to prove eligibility by demonstrating capability in accordance with 21.A.112b, i.e. be a Design Organisation Approval (DOA) or Alternative Procedures to Design Organisation Approval (APDOA) holder if you are an EASA Member State applicant. Alternatively, you may contact a DOA of your choice. Non-EASA Member State applicants do not need to demonstrate part 21 eligibility if a bilateral agreement/working arrangement is in force. How can I know if an STC is still valid? How can I know if an STC has been revoked, suspended or surrendered? EASA certificates are valid unless otherwise revoked, suspended or surrendered. In such cases, a related Certification Information will be published on the EASA website. If you require confirmation regarding the validity of a particular STC, we kindly suggest that you contact the STC holder. I am an EU aircraft owner/operator and would like to apply for validation of an FAA STC installed on my aircraft? EASA has put a new procedure in place to allow EASA member state aircraft owners/operators to apply for the validation of an FAA STC for a single aircraft serial number if certain conditions are met. Please note that High Performance Aircraft and any change impacting noise requirements are excluded from this process and is valid only for Fixed Wing aircraft STCs. The subsequent validation will be limited to a single aircraft serial number to allow the aircraft to be imported and to be issued a Certificate of Airworthiness. This validation is not transferrable to or amendable with another serial number. EASA will charge this activity in accordance with Commission Regulation (EU) No 319/2014 and the applicable fee is set at one working hour per application. What is the procedure for validations of FAA STCs classified as basic? A fast track procedure is in place for validations of FAA STCs classified as basic. According to the revision 6 of the Technical Implementation Procedure (TIP), basic STCs are accepted by EASA without further technical review. However, the issuance of the EASA STC can take place only after the FAA STC has been issued and the complete technical data package has been submitted to EASA including the FAA concurrence letter containing the classification of basic. Am I eligible to apply for an STC? Major changes to type design by applicants other than the TC holder must be approved in accordance with Part 21, Section A, Subpart E of Commission Regulation (EC) No 748/2012. As an EASA Member State applicant you need to prove eligibility by demonstrating capability in accordance with 21.A.112b, i.e. be a Design Organisation Approval (DOA) or Alternative Procedures to Design Organisation Approval (APDOA) holder. The following table describes the available options for specific design projects including STCs. Design Organisation Approval (DOA): The process to obtain a DOA. Further information on DOA. Alternative Procedures to Design Organisation Approval (APDOA): Information on APDOA. However, Part 21.A.14(c) provides the possibility for any natural person to apply for an STC on an ELA 1 aircraft by demonstrating capability through a certification programme. Alternative procedures are not necessary. ELA 1 is generally defined as aircraft with a max MTOW of 1200kg or less, including balloons up to 3400m^3 and sailplanes. Who do I contact to request a copy of a grandfathered STC? France No STC list available, related questions can be addressed to: dsac-nav-bf [at] aviation-civile [dot] gouv [dot] fr. Romania No STC list available, related questions can be addressed to: dir [dot] gen [at] caa [dot] ro. Am I eligible to apply for a change to STC (minor/ major)? For minor or major changes to an existing STC only the STC holder is eligible to apply (EASA FO.CERT.00031 and FO.CERT.00032). I would like to submit an application for validation of an FAA or TCCA STC as an agent and I am not the STC holder. Any application submitted by an agent for validation of an FAA or TCCA STC needs to be submitted in the name of the US or Canadian STC holder whose STC is to be validated. Applications submitted in the name of the agent can unfortunately not be accepted irrespective of whether an authorisation letter has been provided by the STC holder. In addition, the billing address and data on the application form need to be that of the applicant (STC holder). Different billing partners, such as the agent’s, can unfortunately no longer be accepted. Can a DOA with low STC activity decide not to implement LOI processes and continue to operate as before? No, LOI will become mandatory through the amendment of Part 21 and applies to all projects but an applicant’s proposal is required for major changes, major repairs and STCs. If there is an automatic validation of (E)TSO/STC, will there still be an EASA reference and FAA reference for the same modification? No, only the primary certification authority’s reference. Is there a Part 21 Light (DOA\POA) for STC holders for production of low volume STC and limited failure effects (non HAZ/CAT) planned (not only for GA)? Yes, see rulemaking task (RMT).0018 (former task number 21.026). The “Part 21 light” concept is a concept related to the GA Roadmap Project and as such will be applicable only to the low-end General Aviation. The question seems related to STC applicable to all products, but considered as simple. This can be addressed today in the context of the actual regulation. The scope of the DOA can be limited to this kind of activity, and the limited scope would lead to a simplified investigation and surveillance activities. Furthermore, the concept of Level of Involvement (LOI) could allow the product certification team to reduce their level of involvement if the level of criticality is low and if the DOA is performing well. Regarding the abandoned and surrendered STCs, will EASA follow the same guidelines as FAA 8110-120, especially regarding the requirements for Freedom Of Information Act FOIA? The FAA 8110-120 does not apply to EASA. Even if there is no extensive series of examples regarding surrendered or abandoned STC, the Agency principle, similar to the TC case, is that in case of surrendered STC, the Agency keeps the responsibility on the TCH holder and will ensure, in the framework of the Continued Airworthiness, the highest level of safety of the products. The EASA role is strictly limited to CAW oversight. Moreover, EASA is not bound by the FAA Guidelines 8110-120, regarding FOI. EASA is bound by regulation (EC) 1049/2001 on access to documents, which foresees that any member of the public with residence in the EU (but in practice anyone) can request access to documents held by the Agency. The Agency can then decide whether such access might be granted (there are exceptions foreseen in article 4). Such regulation applies only to already existing documents that the Agency holds (either because EASA is the author or because they have been received by EASA in the framework of its institutional activities). This regulation does not apply to request for information where the Agency has to compile a new document to put together the aforementioned requested data and/or info. On EASA STC certificates, the following statement “or later revisions of the above listed documents approved by EASA.” is below the list of “Associated Technical Documentation”. Are documents approved afterwards using a DOA privilege (e.g. minor change approval) covered by that statement? When do I need to apply for an AMOC approval - and what do I need to do? All applications for 'Request for acceptance of Alternative Methods of Compliance (AMOC) with Airworthiness Directive (AD)' must be submitted to EASA using EASA Form FO.CAP.00042 duly completed and signed. It should also be noted that every AMOC application request should relate to one AD only. Below you will find the link to the application form as well as to additional information regarding AMOC. For general information for AD, click here. For further FAQ on this topic, click here. How can I find out if I need to apply for “Forwarding Letter only - without need for technical support” or for “Full EASA Validation Support - with need for technical support”? “Forwarding Letter only”: For third countries that have neither a Bilateral Agreement nor a Working Arrangement with EASA in place. “Full EASA Validation Support”: For third countries that have a Bilateral Agreement and/or Working Arrangement with EASA in place, i.e. USA, Canada, Brazil, China, Japan, and Russia. What is a financial estimate? The financial estimate is for information purposes only and is not mandatory for the applicant and aims at increasing the transparency on costs before the project starts. It is a first estimation of working hours given by the technical section, before starting the technical investigation. The financial estimate is provided to the applicant upon request and only once the financial estimate is confirmed by the applicant an EASA Project will be created. In case the foreseen working hours are not sufficient, the financial estimate may be revised and submitted to the applicant for acceptance. Please note that financial estimates are valid 3 months only. The validating authority is asking for a re-classification to Category 2. What do I need to do? In case the technical investigation is more complex than foreseen in the beginning, the validating authority may ask for a re-classification from Category 1 to Category 2. In order to reflect this re-classification in our EASA system also for invoicing purposes, we would need your active involvement and kindly ask you to submit a revised EASA form FO.CSERV.00041 to Validation [dot] Support [at] easa [dot] europa [dot] eu. On the 3rd page, please delete box 5.2.2 and replace it by box 5.2.3. Which types of approvals can be validated in Third Countries? The following approvals can be validated in Third Countries: Type Certificates (TC), Major Changes, STCs, AFMs and ETSOAs (European Technical Standard Order). Please send an application to Validation [dot] Support [at] easa [dot] europa [dot] eu. ETSO-Applications please send to ETSOA [at] easa [dot] europa [dot] eu. Please also refer to the question on category 1 or 2. I would like to apply for Certification Support for Validation in Third Countries – what do I need to do? You need to fill in the EASA form FO.CERT.00041 which can be found here. Forwarding Letter only - without need for technical support (category 1): Your EASA approval and related documents will be only forwarded together with an EASA Forwarding Letter to the validating authority. There is no technical support foreseen. This EASA service is free of charge. Full EASA Validation Support - with need for technical support (category 2): Your EASA approval will be forwarded to the responsible technical section. An EASA PCM will be allocated your task and will prepare the EASA Forwarding Letter. The Applicant Services Department will then submit the EASA Forwarding letter and its related documents to the validating authority. This EASA Service is charged on an hourly rate. Please consult the EASA fees and charges regulation Commission Regulation No 319/2014 for the applicable hourly rate. A financial estimate may be requested at submission of your application and prior commencement of work. How is the fees and charges category determined for post-TC applications? For all post-TC design applications the applicable F&C category is based on the type level and corresponds to that category in which more or equal to 50% of the models are within a given type. This change was introduced by the EASA F&C regulation (Commission Regulation (EU) 319/2014) as of April 2014 and changed the previously applicable rule that the highest weight category was applicable, even though it might have been only connected to one of the models. In accordance with PART V/Explanatory Note (4) of EASA F&C regulation, the MTOW of the initial TC and subsequently of the majority of the related models covered by this Type Certificate (i.e. more than 50 %) determines the applicable MTOW category. Should the number of models in both the higher and the lower MTOW categories being equal, the higher MTOW category applies. Once the MTOW category has been determined at the product type level, it is to be consequently applicable for all related applications, e.g. for minor changes, STCs, etc. Product categories where the fees and charges category is not based on the MTOW e.g. rotorcraft and engines, are nevertheless treated with the same logic as outlined above i.e. more or equal to 50% of the models within a type determine the final category for each model. EASA has published the applicable fees and charges category for each model in the EASA product list. Why is my small rotorcraft charged as medium rotorcraft under F&C? According to EASA TCDS R.008, the AS350 rotorcraft is a CS27 rotorcraft with MTOW below 3 175kg and a seating capacity of 6, including the pilot. Hence it must be classified as Medium Rotorcraft as per the above definition. According to EASA TCDS R.146, the AS355 rotorcraft is a CS27 rotorcraft with MTOW below 3 175kg and a seating capacity of 6 (or 7, if an optional two-place seat is installed), including the pilot. Hence it shall be classified as Medium Rotorcraft as per the above definition. View the applicable Fees and Charges category for each product. 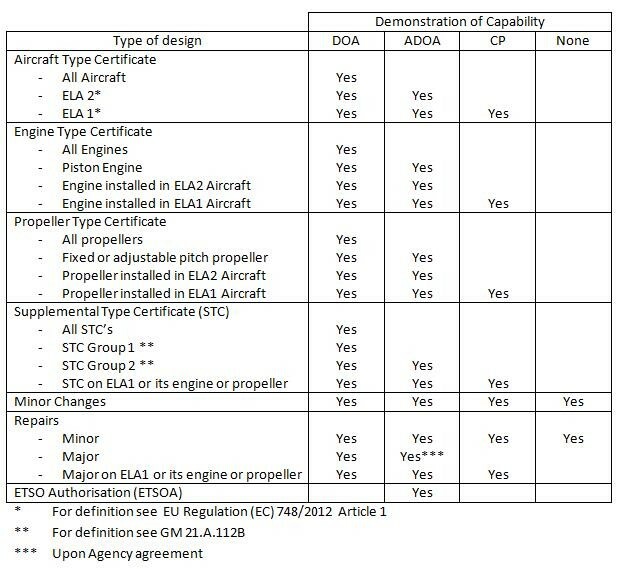 See in particular the EASA Product List – Rotorcraft. What is the status of my project? If you wish to enquire about the status of your project, please contact directly your project certification manager (PCM) by quoting the EASA project number. The contact details of the PCM are sent to you with the EASA Acceptance Letter once your project has been allocated. My project is re-classified, what implications are there? Your project may be reclassified to a higher or lower category, e.g. from Simple to Standard, based on certain criteria that are defined in Commission Regulation (EU) No 319/2014. As a re-classification to a higher category leads to a higher fee, we will contact you first for your acceptance before taking any further action. In case of re-classifications to a lower category, a credit note will be issued, if applicable. For further information on the different fees & charges categories, please consult the tables sorted by application type provided in the Annex of the fees and charges regulation Commission Regulation (EU) No 319/2014. and which can be assessed by the project certification manager alone, or with a limited involvement of a single discipline specialist. All other STC, major design changes or repairs. Significant (*) STC or major design change. (*) "Significant" is defined in paragraph 21.A.101 (b) of the Annex to Regulation (EU) No. 748/2012 (and similarly in FAA 14CFR 21.101 (b)) as amended. (**) For the definitions of "basic", “non-basic”, "level 1", "level 2", "critical component" and “Certificating Authority”, see the applicable bilateral agreement under which the validation takes place. (***) Automatic acceptance criteria by EASA for level 2 major changes are defined in the applicable bilateral agreement under which the validation takes place. Your application may be reclassified to a different application type, e.g. from Minor Change to Major Change based on certain technical criteria that are defined in Part 21. In this case a new application must be made to EASA. I would like to cancel, interrupt or re-activate my project; what do I need to do? You may cancel your project at any time by completing form FO.APMAN.00143 or by sending an email to new [dot] applications [at] easa [dot] europa [dot] eu quoting the EASA task number. We will confirm and, if applicable, proceed with any accounting adjustments. Users of the Applicant Portal may cancel their application directly in the tool. To interrupt a project, please complete form FO.APMAN.00143. - An application may only be interrupted once, for a period not exceeding 18 months following the initial request to interrupt. - If the initial request was for 6 or 12 months, the interruption may be extended to the total of 18 months. - The application validity is not impacted by the interruption. - An application cannot be interrupted retroactively. Any interruption period starts with the receipt of the request at EASA. - EASA will automatically re-activate the application at the end of the interruption period – the applicant does not need to re-submit a new application to re-activate. - Should the applicant wish to re-activate the project prior to the end of the requested interruption period, a request for early re-activation shall be submitted using form FO.APMAN.00143. - The fee of an application interrupted within the first year since the application receipt shall not be reimbursed. Form FO.APMAN.00143 can be downloaded here. For further information on the termination or interruption of your project, please refer to Article 9 of our fees and charges regulation Commission Regulation (EU) No 319/2014. Why am I no longer receiving an AMF approval but a Major or Minor Change approval or an STC instead? EASA has recently simplified the administrative application process for Stand-alone FM revisions and has stopped issuing approvals under the title of “AFM Approval”. These have been replaced by the issuance of a standard change approval (e.g. Minor Change Approval/Major Change Approval, etc.). In the past, applications for Stand-alone FM revisions could be made exclusively by using the designated paper application form FO.CERT.00036. We are now offering the possibility to use the EASA Applicant Portal instead of the paper form and you may simply apply for the pertinent type of design change activity online. Please note that this change in the process has no impact on the fees that EASA will charge. FM revision applications have always been charged in accordance with the applicable classification as either Major Change or a Minor Change. I want to apply for approval of flight conditions - what do I need to do? I want to apply for Permit to Fly - what do I need to do? The European Aviation Safety Agency (EASA) is responsible for the approval of flight conditions. Such an approval is the basis on which a Permit to Fly (PtF) can be issued by the Competent Authority of the State of Registry, or of the State prescribing the identification marks of an aircraft. A PtF is generally issued when a certificate of airworthiness is temporarily invalid, or when a certificate of airworthiness cannot be granted, but the aircraft is nevertheless capable of performing a safe flight. Please use EASA Form FO.CERT.00037 (with EASA Form 18B in the annex) to apply for approval of flight conditions at EASA. With the approved flight conditions (EASA Form 18B) you can apply for a Permit to Fly at the local national aviation authority the aircraft is registered. More information can be found in the fact sheet on Permit to Fly which is published on the EASA website. Please click here.